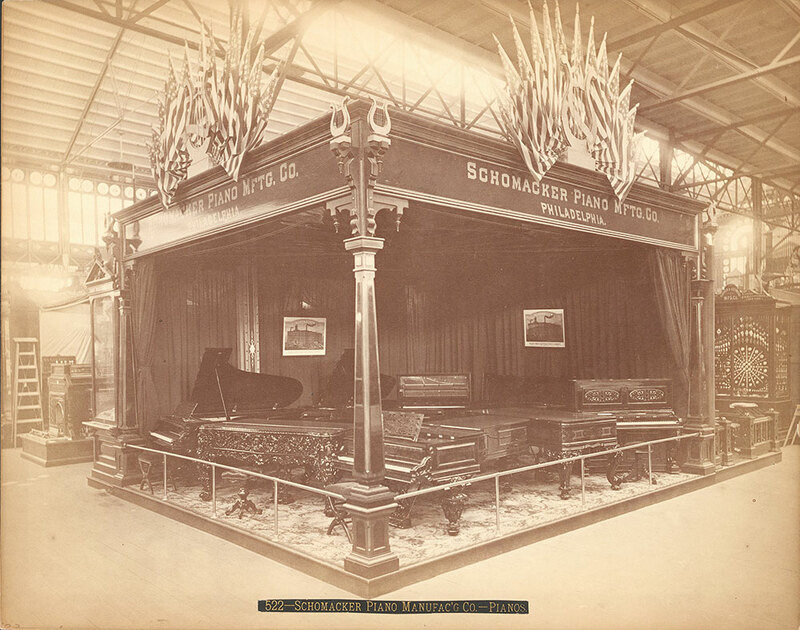 Notes: Exhibit titles: Schomacker Piano Co., Philadelphia, Pa., Exhibit #209; Turner & Seymour Manufacturing Co., Walcottville, Conn., Exhibit #1526, Main Exhibition Building, Bldg. #1. Notes: Grand and upright pianos, piano stools. Pictures of the Schomacker warehouse on the walls of exhibit, flags at top of exhibit. In background is exhibit of hardware from Turner & Seymour. Notes: Title on label: Schomacker Piano Manufac'g C.--Pianos. Turner & Seymour Manufacturing Co.